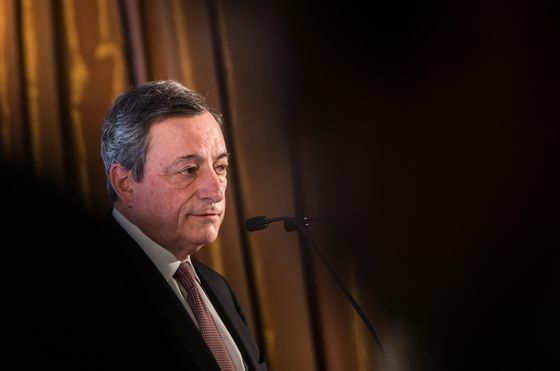 At a meeting by Lake Como in Northern Italy, there was an outpouring of sympathy for European Central Bank President Mario Draghi and the onus his institution has faced to deliver incessant stimulus. With Italy itself in a renewed slump and Germany, the region’s motor, in a funk too, patience over the corresponding inaction of politicians was running thin. The concern arising from Europe’s re-emergence as the weak spot of the global economy in recent months -- and a longer-held perception of its failure to foster growth-friendly policies -- provides a foretaste of the message its finance chiefs may face next week at the International Monetary Fund meetings in Washington. Officials there are poised to release a new outlook for the world economy on Tuesday. While an official leading indicator suggests Italy’s current slump might be about to end, forecasts by the populist coalition government are still set to show almost no growth at all this year. 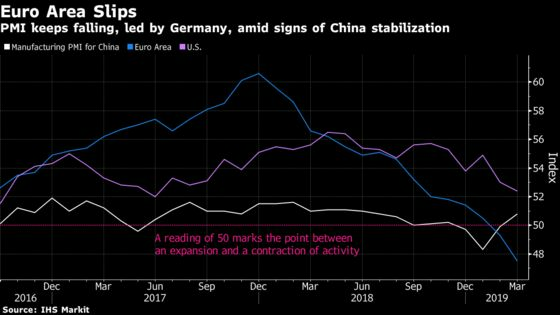 Combined with an industrial-led slowdown in Germany, the region’s prospects have dwindled enough to alarm ECB policy makers. That institution has already cut interest rates to unprecedented lows and delivered repeated rounds of quantitative easing, as the primary actor in stimulating an economy formerly threatened by deflation and crippled by years of crisis. Policy makers’ own calls for a shift in the burden have got louder in recent months as they confronted an intensifying growth slowdown with a much emptier toolbox than before to tackle it. That sentiment was echoed with feeling by a former central banker -- Jacob Frenkel, chairman of JPMorgan Chase International. Yves Mersch, a member of the ECB’s Executive Board, was on hand to emphasize the lack of progress by governments in fostering growth. Only France and Greece have taken far-reaching measures in recent years, and the dearth of action has consequences, he warned. Just as Italy and Germany are focus points for the region’s economic narrative at present, they also provide the primary targets for the economists’ calls for action. Italy has long faced the brunt of criticism for its inertia in delivering growth-friendly policies, while Germany is encountering intensifying appeals to use its fiscal power to aid its own and the region’s economy. The OECD has long had a ready list of fixes for Europe’s growth issues. They now include educating people for a digital world and fiscal stimulus in Northern Europe. “Countries with fiscal space in Europe and who need public investment -- and that’s most countries in the north of Europe -- they should actually do some public investment in infrastructure,” said Boone. Pier Carlo Padoan, a predecessor of Boone’s at the OECD and who was Italian finance minister until giving way to his successor in the populist coalition, warned that the country’s politics pose a particular danger to itself.